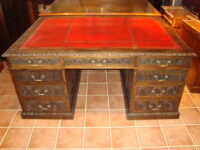 If you would like more information upon our range of Medium Desks contact The Dorking Desk Shop. Edwardian walnut pedestal desk of good proportions. Victorian style reproduction yew wood pedestal desk.